But the legal arguments have to do with gene patents in general. There isn’t much that’s special about human genes; we share 98% of them with chimps. Here is what is special about human genes: a genetically engineered human cannot be patented because of the 13th Amendment, although you can patent any other kind of genetically engineered organism. But the human-ness of the genes in the case may be significant in the end because federal courts have had a consistent aversion to human gene patents (although without addressing why human genes should be different). Listen to this. Trying to figure out how to devise policy that balances economic incentives with concepts of invention and property rights. The problem is, that isn’t his job. That’s what happens when you have a case that turns on a non-existent legal principle. 2. The argument that funding for genetic research will dry up without DNA patents is deceptive and overstated. The vast majority of new genetic inventions — including medical and agricultural — are based on publicly funded research. Yes, private companies do research too, sometimes spending a lot, plus they put out some long green for “regulatory science” (safety/efficacy studies). But more often than not they are capitalizing on basic research done by academics and paid for by the government. In this “human gene” case, a private corporation was spun off from an academic lab doing basic research supported by the government. Specifically, Myriad Genetics was spun off from the Univ. of Utah in 1991 after receiving $5 million from the National Inst. of Health. Their work, in turn, was based on a lot of other public-funded academic work, most notably pioneering research on the BRCA genes by Mary-Claire King at the Univ. of Washington with funding from the National Cancer Inst. 3. The fate of gene patents rests on one of the biggest unanswered questions in law. Products of nature are not patentable; inventions are. What is dividing line? A tree isn’t patentable but a baseball bat carved out of it is*; but why? What is the rubicon you have to cross to turn a product of nature into an invention? What is the deciding criterion? The more you look at the history of court cases confronting this question, the more different answers you find. I pointed out in an earlier blog that courts have for many years just plunged ahead and made decisions in patent cases without a clear legal basis for telling nature from invention. They go with their gut. 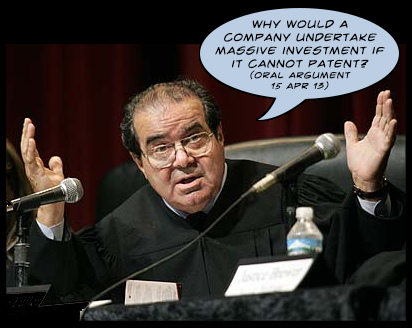 In fact, the last time the Supreme Court saw the Myriad case is a case in point. This case was appealed to them back in 2010. They sat on it a while and then sent it back to lower court and told them to consult another case in which they gave an example of one “invention” that was still a product of nature and one “invention” that crossed the line. But they still never clarified what the dividing line was. Myriad (joined by the biotech industry and the court of appeals) says their gene patent is valid because in the process of using the gene in a test they changed it from a product of nature into an invention. And they did change it too — chemically. Another company called Molecular Pathology (joined by the ACLU, the US Dept. of Justice, and the District Court) says the gene patent is invalid because the only value of DNA is to encode information, and it still encodes exactly the same information after the chemical change. In fact, if it didn’t encode the same information, it would be worthless. * Actually the baseball bat was never patented because it had long been part of the “prior art” of sports, but it would have been eligible back when baseball was first starting up, and there have been many patents on improvements on the bat. This entry was posted in Biotechnology, Intellectual Property. Bookmark the permalink. The 98% with chimps is also DNA sequence match, not “proportion of genes possessed by both species” per se, but of course your point is right that we are really really genetically simlar to chimps. Very interesting point about patenting humans. There’s another argument out there too – that patenting genes doesn’t inhibit research at all, for Myriad is the only culprit. It’s pretty clear, though, that Myriad has used their patent to inhibit research, and that’s research in which I have a personal stake. Gene patents inhibit research big time — especially because so much genetic research has to go through so many separate patents protected by “patent thickets.” The question is if they stimulate even more than they inhibit, and there is now a lot of research saying NO. Interested readers can look at the nifty Science article on “Anticommons in Biomedical Research” and then peruse the dozens of papers that cited it. Gene patenting makes no sense to me. When did it even start? People point to the 1980 Chakrabarty case as a key; it was actually about patenting a GM bacterium rather than a gene, but it set the stage for gene patents that started within a few years. You clearly aren’t the only one who thinks it makes no sense; the district court judge agreed, and so does the US Dept of Justice (which filed an amicus brief). Great job. Thanks for making sense of it.